As a boy, Francisco Camplis acquired a repertoire of songs that would have served him well in Dublin. 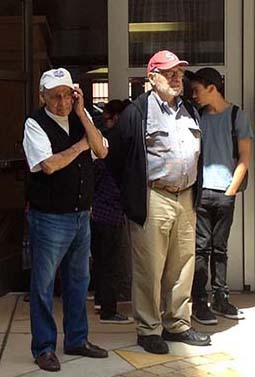 Never mind that Camplis, now 80 years old, was the son of two Mexican immigrants in SoMa. Like his compadres he attended St. Patrick’s School on Fifth Street and every St. Patrick’s Day they learned three Irish songs. “Never did we learn a Spanish song, a Mexican song,” says Camplis. Camplis’s memories are part of a history of Latinos in San Francisco that is currently being compiled by the San Francisco Latino Historical Society. “None of our history was recorded,” said Anne Cervantes, an architect and owner of Cervantes Design Associates and founder of the two-year-old society. Cervantes was referring to the lack of Latino history in the city’s historical context statement—a document used by city planners. Now, that oversight will be remedied. The society in a joint project with San Francisco Heritage is conducting a year-long project, collecting, vetting, and, eventually, publishing, the recollections of old-timers such as Camplis. The goal is to provide a textured look at the presence of Latinos in San Francisco. Nor is it confined to the Mission District; while a recent resolution created the Calle 24 District to recognize the importance of Latino cultural influence in the Mission, Latinos initially occupied other neighborhoods—such as South of Market and North Beach. At the society’s first meeting, Camplis—who, despite his Irish playlist, became one of the founders in 1970 of the Galería de la Raza on 24th Street—dug deep into the Latino roots in the city. “There’s been a Mexican presence in San Francisco since the 20s,” he maintained, and his own story is part of that. His father was one of the many Mexicans costañeros or coast dwellers to come here, boarding a ship in Acapulco and disembarking in San Francisco to work at the ports. “We were a large seafaring labor force, the men were mostly dockworkers,” he said. 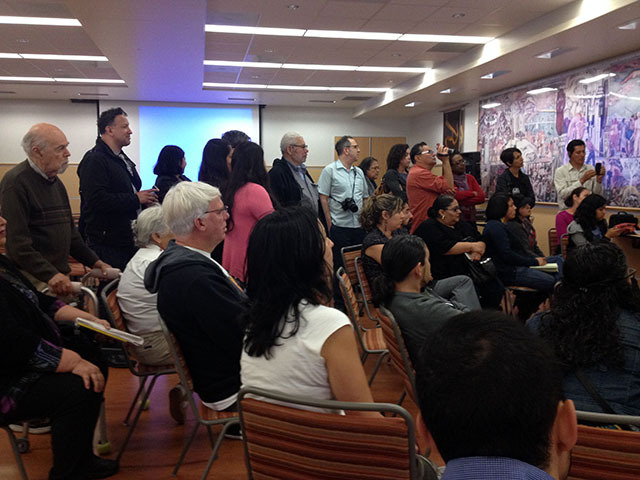 Bob Dominguez, left, and Francisco Camplis, right, watch the opening ceremony of the Latino history project. His father worked at the shipyard in the Ship Scalers and Painters Union cleaning boats—one of the worst jobs, Camplis said. “It pains me that our labor contributions are not there,” in the same way that history has recorded the farmworkers movement, he said and added that many Mexicans belonged to the International Longshoremen’s Union and participated in the 1934 General Strike that brought San Francisco to a standstill. As a young girl, Camplis’s mother worked as a “tamaleria,” selling tamales on roller skates to the workers on Second and Third streets. Later, she worked in the canneries and warehouses making 12 cents an hour. Camplis was born in a house facing the Hall of Justice. It was a time, he recalled, when Mexicans were both proud of their identity and keenly conscious of discrimination. Camplis grew up hearing what had happened in 1933 to the baseball player Tony Gomez, who also grew up on the streets south of Market. “He had the opportunity to show what he could do at Seals Stadium” at 16th and Potrero streets, said Camplis, but the owner and manager ordered Gomez off the field because he was “too dark.” It was a story, Camplis said, that encouraged many Mexicans to identify themselves to officials as Spanish rather than Mexican. Still, the immigrants retained close ties with their homeland. When President Lázaro Cardenas nationalized the oil industry in 1938 and the world reacted with embargos and other financial measures, Mexicans here held tardeadas—afternoon parties—or fiestas to raise money to send home. Camplis remembered one tardeada on Ocean Beach near Playland, an amusement park open between 1928 and 1972. The organizers set up a pretend jail and issued decrees—outlawing hats, for instance—and then had two good-looking women dressed up as sheriffs arrest men with hats. The “bail” money helped Mexico get through the pushback from nationalizing oil. Camplis attended both the University of San Francisco and Stanford, and earned his living as a federal administrator. Still, he also practiced art, and it was that interest that led him to the Mission and his association with the local art scene. He remembers the day that the Nicaraguan artist and curator Rolando Castellón told him that he and a group of other artists had a chance to rent a place on 14th near Valencia Street. All they needed was $300 to $400, and Complis just happened to have it from another arts nonprofit he was involved in. “And that was the beginning of the Galería,” Camplis said. In the weeks ahead, we’ll be recording more stories in Mission Local’s new series History Files. Coming up: the stories of Gloria Ramos, the first Latina to graduate from UC Berkeley with a degree in architecture and a scholar of the history of Latinas in North Beach; Jim Salinas, the first executive president of the Carpenter’s Union, who actually was convinced that he was Irish; and Bob Dominguez, who lived in the Mission for 28 years, taught ESL classes at City College and traces the movement of Latinos from the churches in North Beach to SoMa and then 24th Street. The next meeting on Latino history in San Francisco will be August 9 at at the SF City College on Valencia from 10:30 to 1 p.m. The two histories are not incompatible. The Mexican people and Irish people have much in common. I am part Mexican and consider the Irish my brothers and sisters. I think it’s cool that Mexican people sing Irish songs. Have you heard of the San Patricios? Long live the memory of Capitan Riley and his men! James: yes. Such an interesting episode. And it provided material for one of the best Chieftain’s album ever. A huge shout out and abrazo to Anne Cervantes and Jim Salinas for helping birth, finally and long, long overdue, San Francisco’s Latino Historical Society. My belief, even from afar in Canada, is that the Society will far more grassroots, working class, immigrant affirming, genuine, authentic and inspiring than the corporatist bought and sold Mexican Museum. I was baptized at La Iglesia de La Virgen de Guadalupe in North Beach because my tapatia abuelita, Maria Mercedes Magdaleno, from Zalatitan, Jalisco, and her sisters and co-madres and other Mexican parishioners, fund raised to purchase a Mexican Altar and had it shipped to the Iglesia from Mexico. Back then that segregated portion of North Beach was known as the city’s Latin quarter. I have a framed portrait ready to donate to the Society of my grandmother, her sisters and co-madres, posing on Treasure Island in 1939 at the San Francisco Golden Gate Exposition in full Mexican dress regalia. http://digital.lib.umd.edu/worldsfairs/record?pid=umd:1010 I still remember my Lita telling me about the night she went to see Pedro Infante sing at the Victoria Theatre on 16th and Mission Street. I adored her, and I hunger and cry knowing that her memories of when the Mission was Mexican are slowly perishing in a black funeral of gentrification. We need you to write your families history and places. Please send your contact information to info@sflhs.com or facebook. Thank you Francisco and Ann for reaching back and posting it for our generations to come. Viva los Archives!